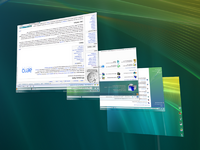 A screenshot of Windows Vista, demonstrating the innovative capabilities of Microsoft and a breathtaking implementation of new features invented from the ground up by its user experience team. Note that your computer will probably not support this kind of graphics (see Minimum Requirements below). License: None. You can trust Microsoft to manage your rights for you, dear customer. This article is about Windows Vista, the operating system. You may be looking for the filthy lies that the luddites and nerds spread, envious of Microsoft's efforts to define the digital future. But we're sure that you don't. Windows Vista is a state-of-the-art, next-generation operating system developed by Microsoft Corporation, the leading and, somewhat, only supplier of operating systems for the PC. This release, which took Microsoft five years of hard work to develop, encompasses all the innovative research that Microsoft's innovation department has done over the years, resulting in a system that takes information management to a new level — a system that can manage the user's information better than the user itself. The technology is so advanced compared to existing computers that it is incompatible with everything released prior to it. 3.1 No seriously, what negative things do customers say? The Internet is a vastly different place than the ol' copper tubes of years past. Everywhere around you, freedom traps you within its confines and won't let go. Until now. Internet Explorer, the free (as in price) browser provides pseudorandom button layout and chunky tabs to make every browsing session a new learning experience. The user is free to not customize all aspects of its configuration, and this choice makes all the difference. Web "standards" are restrictive and stifle innovation. Microsoft's goal is to make the web a better place by introducing proprietary technologies that are not open, and therefore are inherently secure. For example, ActiveX allows end-to-end solutions to be built for remote access to a user's computer. Leveling the playing field, so to speak, conflicts with Microsoft's promise to provide consumers with only the very best software. Internet Explorer 7's "Tryagain" layout engine works dynamically in real-time to modify and enhance rendering on-the-fly, utilising Quirky Freestylin'™ mode, with excitingly varying results. Premium add-ons exist for users who wish to improve their genuine browsing experience beyond the already innovative features of Internet Explorer 7. IE7Pro eliminates the need for secondary browsers by adding unique features such as ad-blocking, a customizable search bar, and the Windows Genuine Inline Searchbar. Everyday, customers are threatened by Linux, a viral operating system that can prevent Microsoft from giving the user more innovations with each new Windows release. It also compromises software developers' digital rights on any Windows computer running a "dual boot", thereby making the user's computer less secure. Until now. When Windows detects Linux, it will automatically reformat your hard drive to protect you. If Windows Vista was installed before Linux, Windows Operating System Protection will start the reformat at the beginning of your hard drive to ensure that Linux is safely removed. File:User Account Control.png Following the celebrated tradition of Microsoft innovation, third-party code has been used under license from the Union Aerospace Corporation, a relatively small industrial company based on Mars and its two moons. Through an exclusive defense contract, Microsoft has access to the entire portfolio of technologies in the corporation's possession. Microsoft leverages these technologies to the fullest extent to raise hell for its competition. Developers have struggled to find ways to increase dependency on additional runtime libraries and frameworks. Until now. Combining the .NET Framework 1.1 and the .NET Framework 2.0, the .NET Framework 3.0 is less than the sum of its parts (3.1 would be yummier). In particular, the Windows Presentation foundation has made users look forward to this non-backwards compatible update to download, and will be left feeling right at home. While other operating systems have only recently begun to implement "eye candy", the Premium version of Microsoft's home operating system has integrated an innovative new feature called the Aero interface. 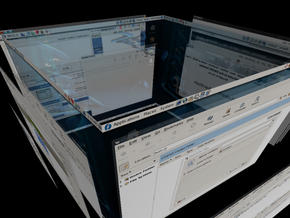 This interface allows the user a visual experience never before seen in an OS. Windows Aero Interface will operate on most graphics cards with at least 2 GB of graphics memory . Windows Vista has decided that you and your computer system do not deserve to view this section. Vista is very secure. Even a compromised keyboard will have trouble hacking your computer. Industry-grade continental-level backbone internet connection. (Recommended: OC-768 / STM-256x). Any keyboard and mouse. Unlike Windows XP, Vista supports even the oldest keyboards and mice interfaces. This is a huge innovation from it predecessor and took Microsoft 5 full years (from 2001 to 2006 inclusively) to be tested and functional. 3.5" floppy drive to back up your system. Vista supports Microsoft's patented compression technology so that anything will fit onto your disk. This is known by Microsoft as your A: drive. No seriously, what negative things do customers say? 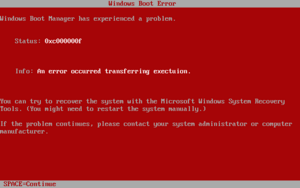 The Red Screen of Death was the biggest innovation to come out of Windows Vista. Microsoft does not want to listen to the people who do not respect copyrights its customers. The occasional criticism of the Windows Content Protection system on the grounds that it "disrespects users" has no merit; this feature is designed to help users, not disrespect them, by guiding them within the limits of copyright law and teaching them to distinguish right from wrong. Windows Vista's alleged problems with hardware are non-existent; the worst a customer can experience are problems with drivers, mostly caused by the potentially viral drivers disabled by the Vista security system. Potentially viral drivers, especially those with publicly available source code, can damage the Vista kernel, undermining the system's security dramatically. 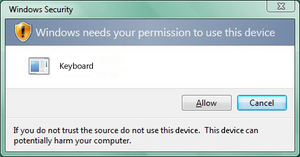 We recommend you not to use hardware for which no Microsoft-approved drivers exist. According to Darwin's Third Law of Evolution, convergent evolution is the process by which different things change to look the same, even though on the inside, they are entirely different. During Vista's long development period, its innovative physical appearance has changed dramatically. While this was partly due to adaptation, it was mostly the result of natural changes that every OS goes through at some point in their life. Files started to appear where no files had ever been before. Vista started noticing other operating systems, and got funny feelings when they were around. Pretty soon, the processing power required to run Vista started increasing. Vista's RAM usage also started growing. Microsoft's self-made airline with a Windows Vista livery, also "Vista-Inside". Windows Vista aircraft in-flight. Don't worry, the flame shows are all part of your deluxe airfare accommodations package. Microsoft have tried really hard to persuade people to buy Windows Vista. This includes using the method of "Buy Ultimate, get 10 free Premiums" and giving out free PCs if you buy 5 of their Ultimates. Another (controversial) Microsoft advertising method, threatened to kill a "dog" if you didn't purchase Windows Vista. This method proved to be extremely successful with animal lovers and pet owners, due to the personalized nature of the advertisement. Using technology only Microsoft will ever know about, the advertisement specifically shows the users dog in the picture. If the user didn't own a dog, a BSoD was shown instead, although this was just as effective anyway. Basic class: comes with the seat, that's pretty much it. Premium class: the same as Basic, but you also get an in flight movie and a free meal and drinks. Business class: the same as Premium, but you get a comfortable leather seat, an in flight magazine and a glass of wine if your over 14. Ultimate class: the best of the best. Premium and Business classes combined, except that you get a bed instead of a seat. Also comes with Ultimate extras that people on other classes can't get. 10 GB 4 GB Depends... A small installation size implies not nearly enough pictures. Microsoft Office Extra Ribbon Bar Edition Real men use Emacs GEdit Do you want to be a businessman or a scruffy hacker like RMS? Windows Defender will protect you! GPL infection by default None (except these WMD's ) With Linux you can share, on Vista your desktop is shared with zer0c00l automatically. Why do you think they don't have a bug tracking system? There are no bugs! Only features. Every bit of software is written by the incredible hacker Linus Torvalds. Yup, all 121 million lines of code. The Kernel is likewise written by Linus. Everything else is written by this Debian chick One way or another your computer will crash like the US stock/financial market. You don't know what driver to install? Windows ain't helping. Open Source Drivers that take up 5 KB. Whatever can be found in apt-get, or that you can compile yourself. Open Source Drivers are written by evil hackers who put backdoors in their code and use it to control your PC and your mind to brainwash you into Communism. Chris Pirillo: "Windows Vista Rocks!" This page was last edited on 3 October 2012, at 06:54.